You are here: Home / Blog / Careerhub / More of us than ever are working flexibly and you can too. More of us than ever are working flexibly, at times and in locations that fit around our lives – and the trend is set to continue. A study by Lancaster University, predicts that flexible working will be the main way of working for 70% of organisations by 2020. If you work on construction site, use specialist equipment or don’t work behind a desk you may be reading this and thinking there’s no way I could work flexibly, I need to physically be there to do my job. But there is often a misconception that flexible working can only work effectively when you work from a laptop at home. Flexible working can cover anything from remote working, job shares, condensing hours, reducing hours or reducing your lunch break to leave work earlier. Essentially flexible working is changing your current working pattern to meet other needs in your life. 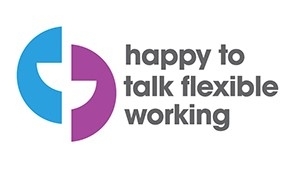 With only 11.9% of jobs vacancies in Scotland being advertised as flexible at the Equate Careerhub we encourage all employers with a flexible working policy to promote it on the job description through Family Friendly Working Scotland’s, ‘Happy to talk flexible working’ logo. And for any employers who do not currently practice flexible working to strongly consider it. At the Equate Careerhub we encourage all employers to use the ‘Happy to talk flexible working’ logo on their job ads. If flexible working is not obvious on the job advert, do not hesitate to call the HR department before you apply. Ask whether flexible working is a possibility in the role and whether there are already people working flexibly in a similar role. This is usually a good tell-tale sign whether flexible working is the norm. If you are looking to work more flexibly at work to fit in with other commitments, firstly decide what flexible working would look like for you. Is it condensing hours? Working from home? Coming in to work an hour earlier in order leave an hour earlier? Or, going part time? Once you have this decided request a meeting with your line manager. Start with explaining why you are requesting flexible working and how a change in your work pattern would work for you while also continuing to meet the needs of the organisation. Employers are crying out for skills and are finding it increasingly difficult to fill roles in STEM. If you are in a senior position, have hard – to – find skills or you have wealth of knowledge and experience you are in a strong position to negotiate. Equate Scotland have worked with employers that do not advertise flexible working but once through the interview process would offer flexible working, reduced hours or consider a job share to the right candidate if they requested it. If you are applying for a new job and these options are not obvious from the job description, don’t be put off applying because employers need talent and they will bend over backwards for a candidate with the right skills. If you are already in a role and requesting flexible working, remember your value. Recruitment is expensive and on average costs an employer up to £30,000 to recruit a new member of staff. If your manager refuses to consider flexible working they could risk losing you to a company that does offer more flexibility. It is your legal right to request flexible working. In the UK if you have been working for an employer consecutively for 26 weeks you have the right to request flexible working. Although employers do not have to grant your request, they do have to demonstrate they have taken serious consideration of the request. When requesting flexible working do not apologise for it – 94% of UK workers do not work traditional 9 – 5 hours. Flexible working works for everyone, not just people with children. Flexible work is becoming the norm and employers are increasingly aware of the benefits flexible working provides both in terms of productivity and employee satisfaction. If you are in an interview, it is important to know whether the role will fit in with your lifestyle so don’t be afraid or apologise for asking. As long as you demonstrate throughout your interview that you are applying for the role because you have the right skills and you want to work for the organisation, then an employer should not be put off by a question on flexible working practices. Flexible working or working from home does not mean you have to be available all the time. Evidence shows that people who work away from the office overcompensate with their communication and work longer to show their colleagues they are in fact working. This is counterproductive and comes from a misunderstanding of what flexible working actually is. Looking for a new job with flexibility? The majority of employers on the Equate Careerhub have a flexible working policy and are aware of the benefits of flexible working on employees. Check out current our current vacancies here.